Barking is a normal activity for dogs. Dogs will use their bark to express a number of emotions and a bark can mean different things depending on the situation. While it's not reasonable to expect a dog to never bark, excessive dog barking can be considered a behavior problem. Why Do Dogs Bark Excessively? To be a good canine citizen, your dog needs to know when to bark and when to be quiet. Part of your job as a dog owner means teaching this to your canine. Start working on problem barking as soon as you can. The longer you wait, the harder it gets to curb the behavior. It's a good idea to teach your dog the Speak/Quiet Commands, although this may be easier said than done. The goal of these commands is to teach your dog to bark on command and to be quiet on command. It may take weeks for some dogs, so continue the training or work with an expert for extra help. If your dog has been trained and continues to bark too much at certain times, you'll need to understand the cause of this behavior. Some dogs bark because they're in pain or have a medical issue. Check to see whether your dog has a tender spot somewhere; it will bark if that area is touched. As dogs' age, it's quite common for them to begin to bark more (and make more noise in general). Some aging dogs can begin to excessively bark; some may bark for hours on end, completely unaware of what they are doing. Besides canine cognitive dysfunction, which is likened to Alzheimer's disease, aging dogs can have vision impairments, deafness, or body aches and pains that can lead to barking. If your dog is fearful, they will voice this concern via barking. This could take place at home or away and refers to anything that frightens your dog. It could be a person, a loud noise like fireworks, or a strange (or new) situation. Dogs can become territorial if a new person or dog comes into what they consider their territory. They feel possessive of their area and want to protect it. A dog's territory could range from their home, their yard, or even their bed. If a dog only barks at this situation, this is likely the cause. Dogs are naturally pack animals, meaning they prefer the company of others. If they're alone for excessive amounts of time, they may bark as a sign of unhappiness. A dog may also long for human company and not just another dog's company. A bored dog or one that isn't getting enough stimulation (both mental and physical), can also bark excessively. A greeting bark is usually a friendly bark. It can become a lot when the greeting is given to everyone the dog meets. Excessive barking can signal the dog is hungry, needs to go out, or just wants some attention. Dogs that do not like to be left alone suffer from separation anxiety. 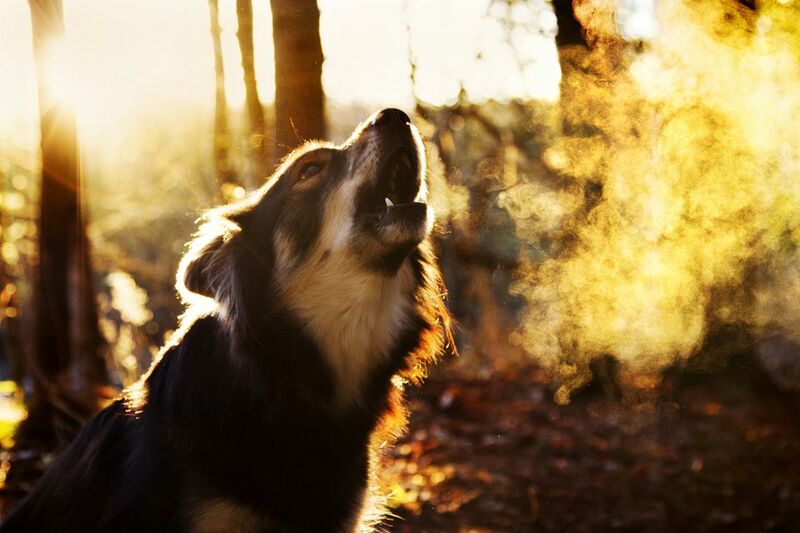 In addition repeated barking, dogs with this condition will usually exhibit other compulsive behaviors. The best way to prevent barking in the first place is to try and remove any potential sources of the behavior. You should also avoid inadvertently encouraging the barking and give your dog better things to do. If the excessive barking behavior is new for your dog, consult your veterinarian to address any health conditions. They will rule out any medical conditions or injuries that could be causing the barking and help you develop an action plan based on your dog's needs. An aging dog that is displaying excessive barking will have different medical needs and action plan than a young dog. For aging dogs, try to find out the source of the barking. Limiting social settings and creating a smaller area for the dog to hang out can help. For example, limit access to the whole house and keep the dog in one or two rooms. To help stop excessive barking that can be caused by fear, territorialism, lonliness, or attention seeking, try to pinpoint the exact trigger. If possible, remove that trigger from your dog's life and work on behavior modification training. Start with basic commands, like sit and down in order to shift the focus from barking and reward your dog for good behavior. Give your dog plenty of exercise, so it has less pent-up energy to burn via barking. Mentally stimulating chew toys or puzzle toys are also helpful. If your dog is suffering from separation anxiety, avoid leaving a lonely dog by itself for long periods of time if possible. Then work with a specialist or find a program that can recondition the dog to separate from its owner. This type of training/retraining can be time-consuming. Never comfort, pet, hug, or feed your dog when it's barking for attention or because of anxiety. Otherwise, you're rewarding the behavior, thus encouraging it. Never yell at your dog. Not only will it not help to extinguish the behavior, but it may actually stimulate the dog to bark even more. Do not hit your dog or use devices like shock collars. This is not only painful and unkind, but some dogs learn to test them and eventually figure out how to work around them. Don't let your dog bark constantly when it's outside, regardless of the reason. You can hardly train the dog to stop barking by yelling at it across the yard. Plus, it is one of the fastest ways to turn neighbors into enemies and send an invitation to your local police. "Debarking," or cordectomy is an elective surgical procedure involving partial removal of a dog's vocal cords. Debarking does not take away the dog's ability to bark, it just makes it sound quieter and raspy (considered annoying by some). In almost all cases, debarking surgery is unnecessary and unfair to the dog. Surgery and anesthesia are always risks, so any procedure that is purely for human convenience and does not medically benefit the patient or animal community should be avoided. In addition, excessive barking indicates an underlying issue that is usually behavioral. Surgery takes the noise away, but the anxiety, fear, or similar problem remains unaddressed. Rather than debarking your dog, spend your time and money on training and/or visiting a veterinary behaviorist to learn how to get your dog to stop barking. This expert will work with you and your dog to help identify the cause of the barking, come up with an action plan to reduce it, and work with you to carry it out. Speak with your veterinarian for a recommendation.